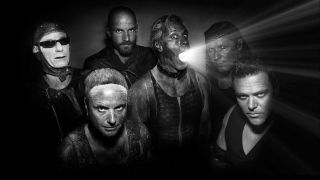 Rammstein are looking to the spring of 2019 to release their highly anticipated new studio album, according to guitarist Paul Landers. Last month, the band checked in from the studio where they’ve been working on the follow-up to 2009’s Liebe ist für alle da and reported in the summer that the as-yet-untitled record was entering its “final phase” of production. Landers has spoken with Music Radar about the album in a new interview, where he also gives an insight into how they’ve been working together behind closed doors. Asked about how the new material is progressing, Landers replies: “Right now, it looks like this new record will be coming out next spring, and what we’ve been mainly doing is playing together in a circle, with all the guys in one room. “We all go into the mixing desk and I had my PL1 prototype going direct. Same for the some of the other guys – our drummer Christoph Schneider has these electronic drums, so we’ve been using that to play a bunch of ideas together. Landers and fellow guitarist Richard Kruspe previously told Metal Hammer that their goal for their seventh studio album was to “try unusual methods, new ideas, and change the path that one usually has” and make it a “milestone” in their career.